Love them :) thanks for sharing! I miss having pony’s for sure! Make sure to post lots of updates !!!! Quick update. 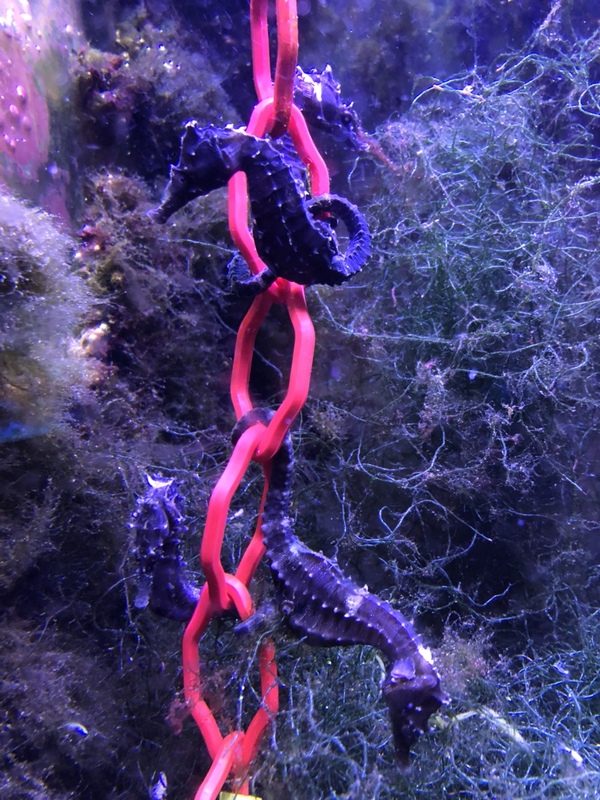 So if you’ve ever researched keeping seahorses one of the big pitfalls is that they need to be fed several times a day. Something I hate doing tbh. So as luck would have it I seamed to have come up with the perfect situation. The tank I put my seahorses in was originally my Refugium, which if you don’t know what this is, it’s a separate tank tied into a salt water system that is lit up brightly to grow algae to purify the water from such things as nitrates and phosphates. The other things that tend to grow there is small crustaceans called pods. Well my refugium had quite a few but once I started feeding the seahorses with frozen food the pod population exploded. There’s literally thousands of them. So the seahorses have pretty much an endless supply. 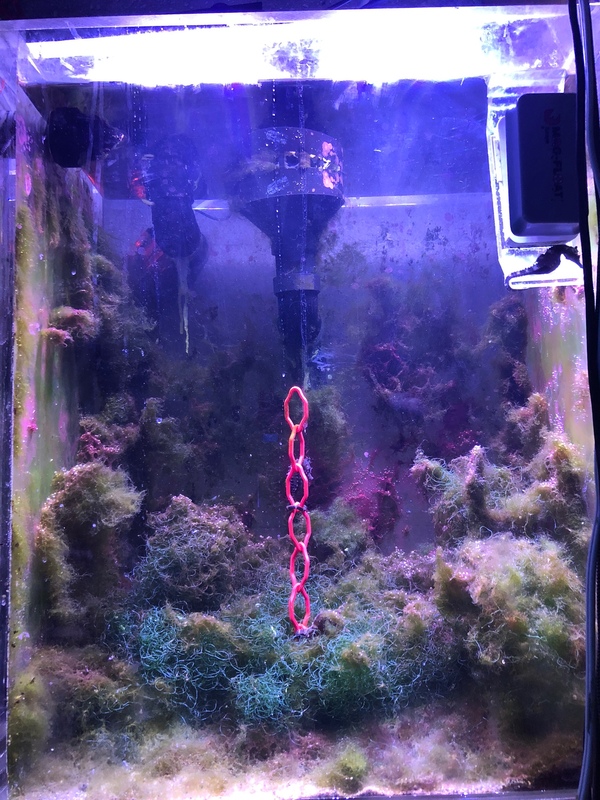 I just have to feed the pod population which seams like it is getting bigger instead of shrinking with the seahorses in there. The only problem is that it’s ugly lol. The tank looks horrible as far as tanks go but it’s about as healthy as it gets for keeping pony’s. Plus it still doubles as my refugium. I’m hoping there’s even enough micro fauna that if they have babies some might actually survive. I may expand this tank too. I’m really liking keeping these amazing creatures. Here’s a pic of the ugly lol. Thats probably the most natural aquarium you could even provide for them! I only see two there, are the others hiding or did you end up parting with a pair? Raising babies in there should work well! What temp are you keeping the tank at? That was my biggest challenge my house was too hot for sea horses in the summer and I wasn't ready for a chiller! Thanks Stacy. I’m not sure what the tank temp is but I’m sure it’s lower than my main tank which is about 77-78. I’m guessing the seahorse tank is around 75 cause I’ve only got a trickle of water going in. I still have the 4. But I think I got 3 males and one female. I’m not sure how that’s going to work long term though. Maybe she will breed with all of them. Or once they mature more the battles might start. How long did you have yours? Did you successfully raise any babies? I had mine for 4-5 months before I lots them to bacteria infection, at least that's the MY best guess. As much as I want more I know I can't provide the proper environment for them year round, it was pretty heart breaking to watch and feel so helpless. As for babies, my male kept losing his eggs pre maturely. However seahorses from One Fish Two fish often had babies that I tried taking home and raising. It was a lot of work. Daily water changes, hatching brine shrimp 3 times a day.......only to lose them after a few months. Could never seem to get them more that and inch in size. Very frustrating and heart breaking. Being able to raise yours in tank with the parents will work much better, unlimited, nutritious food source will go really far! Thanks for the info Stacy. So sorry to hear. If I can get mine breeding I’ll make sure you get a few of the babies. There’s a simple cheap way to cool a seahorse tank without a chiller. Also how would you go about keeping it cool? I tried fans, on the surface, lots of agitation, made sure it wasn't in direct sunlight, but I think it was just too damn hot this summer! I will have to look I to this further!! Stacey, I was thinking it was you that had seahorse she before. Was that a few years ago now?